Yet my legs ache, my shoulders likewise, and the right side of my face is sunburnt. I never expected Devon and Dorset to be such hard work, but like a dilophosaurus, the small ones can sometimes take you by surprise. It’s hard to avoid the dinosaur links in this part of the country. Yet despite the age of the rocks, I can’t help suspecting the ubiquitous label is a relatively new creation. I grew up only 60 miles away, and don’t remember anyone ever calling it the Jurassic Coast. We just called it the coast. There’s more to enjoy than the dinosaur references, though, and as I battle the seagulls for my chips, I recall the highlights. 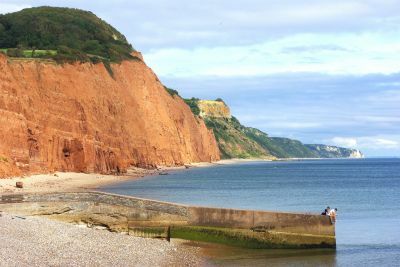 The magnificent sandstone sea stacks of Ladram Bay; the fishing beach and crowded pubs of Beer; the other-worldly woods of the Undercliff between Axmouth and Lyme Regis. You can pack plenty into two days of walking down here. Lyme Regis is equally adept at marketing itself, and it’s not just dinosaurs and fossils here. The Cobb, a sea wall that encloses the harbour, plays a pivotal role in The French Lieutenant’s Woman, and the town is the setting for parts of Persuasion by Jane Austen. 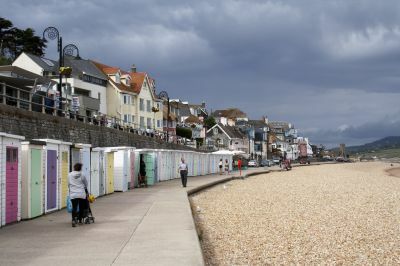 These literary connections sit well with its fiercely defended reputation as a bastion of the more genteel end of the British seaside spectrum. So genteel, in fact, that there isn’t a campsite, meaning I still have a few miles to walk to the nearest one in Uplyme. I reluctantly strap my backpack once more and head inland, making a mental note never to underestimate coastal walks again.